New York Cheese cake has been around for many years. It is a classic but still one of the top favourite desserts served today. Surprisingly cheesecake is extremely easy to make. 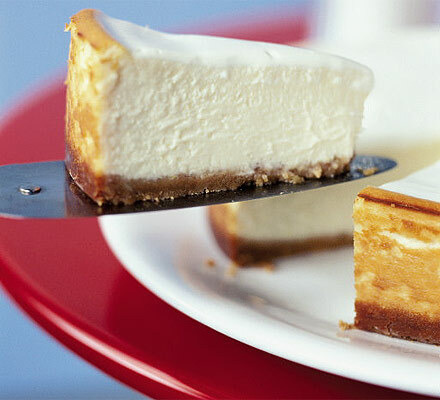 New York Cheesecakes are creamy, thick and self indulgent. If you want to choose a dessert for your next dinner party then this finely prepared delicacy can be the perfect choice for you. First of all, you need to preheat your oven to 350 degrees Fahrenheit and grease the spring form pan. Take a medium sized bowl and put crushed graham crackers and melted butter in it. Mix them well together using a mixer, before pressing it firmly onto the already prepared pan. Take another bowl and mix together your cream cheese and sugar until it gives a smooth texture. Now you can blend in the milk, before adding in one egg at a time. Now pour in the rest of your ingredients and stir until they are smooth. Pour the filling onto your prepared crust and bake it in the oven for around one hour. After an hour is up, turn off the oven and let the cake cool in there with the door closed for a good 5 to 6 hours. Chill it in the refrigerator until served.